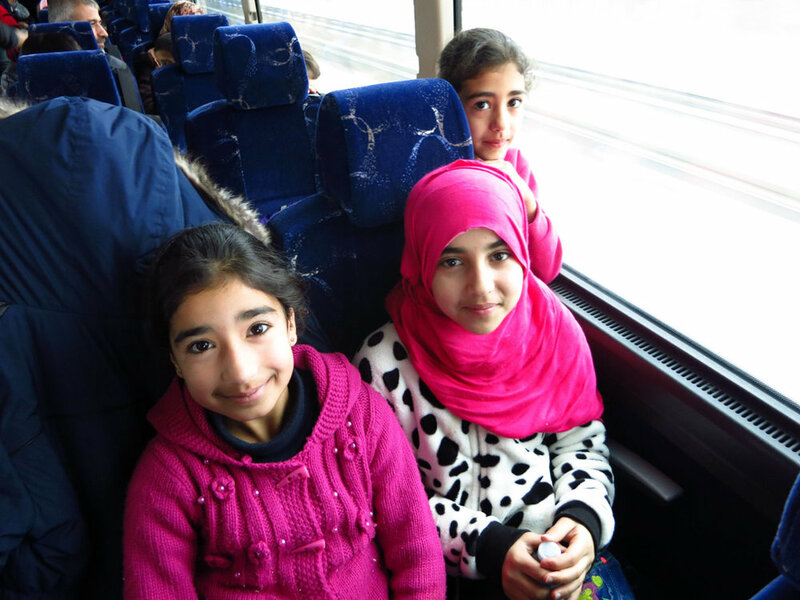 On March 1st, 2016, we were able to give a group of 54 Syrian Refugees the opportunity to go play outside at Arrowhead Provincial Park, with the help of Naturelinx, Parkbus, CultureLink, Parks Ontario, and the Huntsville SRS. 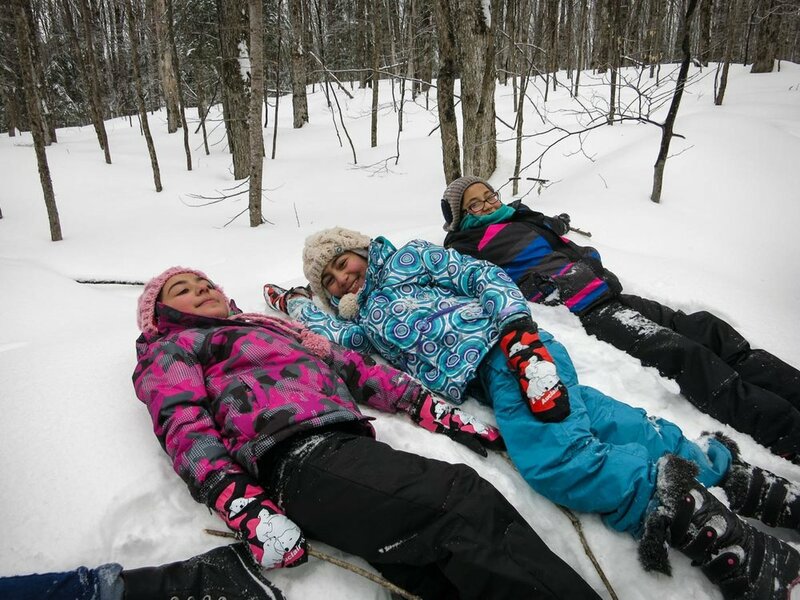 We were approached by Naturelinx to see if we were able to donate our time to make sure that the group had a great day playing in the snow and we were excited to help make this day amazing. Since we often have the pleasure of taking people new to Ontario on amazing adventures, I initially used that model to try and plan the day. When we boarded the bus for the first time, we got to meet our group for the first time. 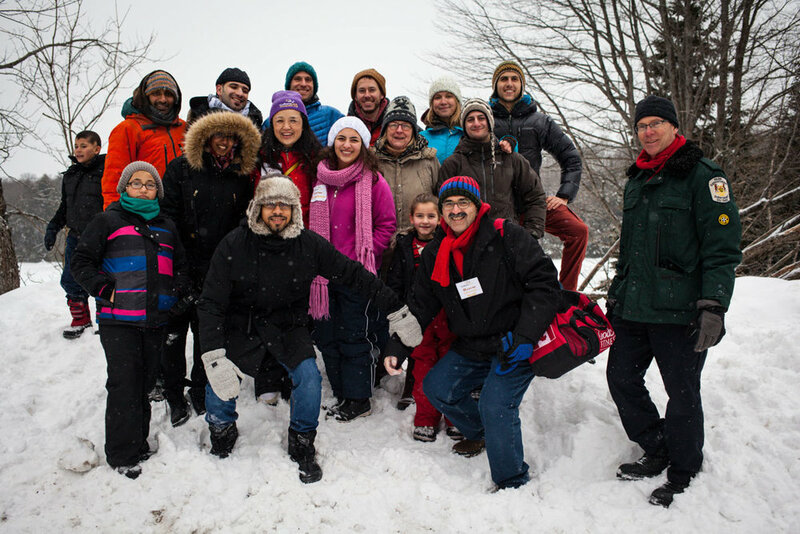 Culturelink had brought together 8 families, each with a mother and father, and a group of children ranging from ages 2 to 17, and outfitted them entirely with winter gear. We also, unexpectedly, had 2 additional 17-year-olds who arrived to Canada without their parents join on that morning. For the first hour and a bit, the bus ride was incredibly quiet and I was worried that with the language barrier, it would be a challenging day. At one point though, one of the little girls looked outside and saw the banks of the road filled with snow, called the other children over and they all just stared outside the window. This was the first time any of them had really seen snow. It was a truly wondrous and humbling sight. After that, they started singing and clapping, and within 20 minutes, the whole bus was singing traditional Arabic songs. When we arrived to the park and first got off the bus, things were quite chaotic - some children needed the bathroom, some needed to have mittens and hats put on them, some just wanted to run into the snow. The translators did their best to help coordinate everyone, but it was definitely tough to get everyone together and listening. I hate man-made chaos in the outdoors - it's how people end up getting lost or hurt, or things get damaged - and we were not off to a great start. To try to get everyone together, my guides and I walked over to a large mound of snow and just started throwing snow at some kids. Language barrier or not, if someone throws snow at you, it's time to start throwing back. We ended up having a 50-person snowball fight! The kids, the adults, the teens, the guides, the volunteers, the coordinators. Everyone! It was incredible. We started forming bonds with the kids and the adults. Alliances and teams were naturally made. We helped out teammates climb the mound and protected it with vigor! I remember the first kid who got a bunch of snow go down their back and the subsequent shriek and frantic attempt to get it out. Once we knew everyone was around us, we called the whole group together and divided them into 2 groups with 4 families in each. One group went straight to the nearby tubing hill and started launching kids and adults down the hill. My group, on the other hand, threw on some snowshoes and started to wander into the woods. I say started because we didn't actually make it that far into the forest. We found some waist high snow and the kids then did one of three things: either they ran around and laughingly fell into the waist high snow; had their snowshoe fall off and ask us to put them back on; or team up with other kids to pelt my co-guide and I with snow while we were helping other kids put their snowshoes back on. If I didn't know better, I'd say they planned it because it seemed that as soon as we got one set of snowshoes on, another kid would approach us with a snowshoe in their hand. We ended up scraping the idea of snowshoeing and just played in the snow instead until lunch. We ended up with a lot of faces full of snow, a few hands that needed some thawing out in the warming hut, and a lot of smiling faces. After lunch, we swapped activities and my group went tubing. There is something amazing about flying down a snow hill in a tube. Children, adults, guides - we were all loving it! By the end of it, we were connecting tubes together and going down in groups. The last run was just the adults together and the kids pushed us down! What a fantastic time! With the beautiful weather, we ended up with another session of faces full of smiles and a few cold fingers. After this session, I felt a lot more connected with the families and especially the adults. By this point I early learned a few Arabic words. Just the basics though: Yella (let's go) and Hallas (wait up). The kids had a great time telling me to go and then repeating me when I would tell them to wait up. The kids were truly amazing. Smiling and laughing and really putting down their guard with us. After the park, we headed to Huntsville to the Trinity United Church where a group of local volunteers had prepared for us a feast. Now that statement in of itself is an understatement. A number of people in the community each prepared a home-cooked dish and brought it for the Syrians to enjoy. There must have been 30-40 different dishes, and 10-15 different desserts. There was so much food that even after everyone took a container home with leftovers, there was still leftovers! There was a piano at the church, and one of my guides decided he would play "Imagine" by John Lennon. It was a really nice moment, and it kinda hit the rest of the guides in a powerful way. We looked around us and looked at all the smiling kids that we had quickly grown to know and shared this amazing day with. It dawned on me that each and every one of them got to experience today because each and every one of them had to flee their homes and travel across the globe, without some of the members of their family, to be somewhere safe. Of course I knew that beforehand, but until that moment the Syrian refugee crisis didn't have a face. Now it was the little boys and girls who happily smiled as they tried to teach me to count to 99 in Arabic. The two-year-old whose older sister gave to me to hold for a few minutes, who by some miracle wasn't one of the many 2-year-olds that were killed during the civil war. The smiling fathers, who held my hand a little bit longer and looked me in the eye a little bit stronger when we were saying goodbye. It was the two 17-year-olds who were in Canada without their families... On March 1st, 2016, they were smiling, laughing, and playing in the snow, and until Elan played Imagine, the hardships that they had to have endured and continue to endure, and the senseless needless forces that culminated in us taking them outside to play in the snow, were things I knew about, but not truly. They were stories and photos until that point. As I write this, I sit here with a weight on my chest as I think about the boys and girls in my group. Their smiles and their laughter, and how so easily it could have been them in the over 250,000 who have died so far during the way, or the countless others who are still stuck in Syria. On March 1st, 2016, we were able to give a group of 54 Syrian Refugees the opportunity to go play outside at Arrowhead Provincial Park, with the help of Naturelinx, Parkbus, CultureLink, Parks Ontario, and the Huntsville SRS. 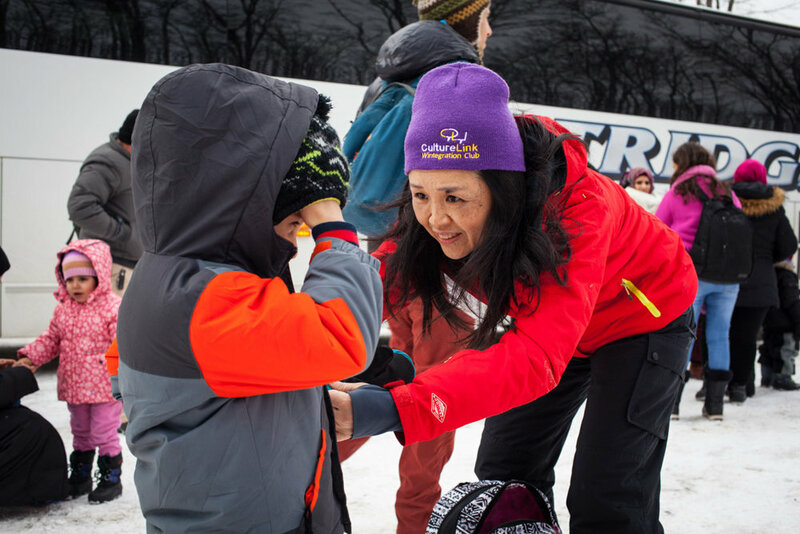 We were approached by Naturelinx to see if we were able to donate our time to make sure that the group had a great day playing in the snow and we were excited to help make this day amazing. Looking back, I remember how excited I was at the opportunity. Now, with the weight of the gravity surrounding their day outside, I feel like this day was so small, as though what we did could have been no more than a drop in the bucket for them. I am confident that those who were able to come with us had a great day and I truly hope that this helps them feel more comfortable in Canada and helps them see that Canada's outdoor beauty is truly an integral part to what makes it so special. It's with such a mixed bag of emotions that I write this. Really grateful to have had the opportunity, and really amazed with the hard work of my guides, and all the folks who worked so hard to put this together, and also so humbled by the endurance and smiling faces of the children who are old enough to be very aware of their situation. Newer PostHow do I make a bowl out of logs and fire?